A good cleanser is the foundation of any skincare routine. But not all cleansers are created equal. Most of the cheaper drugstore alternatives we used in our teenage years are actually packed to the brim with harsh additives, chemicals, and even pore-clogging ingredients that might actually be making your skin worse—hence the frugal price tag. Using the wrong cleanser is pretty much like washing your skin with detergent: That squeaky-clean feel may leave you feeling like you’re getting a deep cleanse, but really, your skin is being over-stripped of its natural oils. And though a few tough-skinned people can tolerate the harshness, most of us are left with flaking, itchiness, and irritation—and who wants that? So, what can be done to give your skin a deep cleanse without leaving it bone-dry? The answer is pretty simple: Switch to an oil cleanser. Using oil to clean your skin may sound like an oxymoron, but hear us out. This K-Beauty essential can be used either on it’s own or in tandem with a regular cleanser for an invigorating touch to your skincare routine, as licensed esthetician and founder of StackedSkincare Kerry Benjamin advises. So, what’s the difference between a facial oil and a regular cleanser? According to Victoria Fu and Gloria Wu, the chemist duo behind Chemist Confessions, there’s one major distinction: “They differ in that they’re oil based while the average cleanser is water-based,” they said. “This is key when it comes to makeup removal since most makeup are oil-based.” This may seem like a small factor, but it plays a major key in having a clearer complexion. Now, time to switch to any of our favorite facial cleansing oils below — your skin will thank you for it. This is probably the most popular cleansing oils on the list, and rightfully so: It works wonders. The mixture of wrinkle-reducing camellia and anti-aging rice bean oils gently cleanses skin and removes makeup, all while balancing your skin’s moisture levels for a dewy, youthful appearance. Try using Benjamin’s favorite skincare hack: using pure jojoba oil as your go-to oil cleanser. “You don’t need to spend a lot of money on a fancy cleansing oil for a double cleanse,” she said. “I love using jojoba oil and you can pretty much buy it anywhere. It’s noncomedogenic, meaning it won’t clog won’t clog pores, so it’s great for all skin types.” Try using this inexpensive buy, for all of the hydration at a fraction of the cost of other oil-stripping cleansers. Not only does this oil cleanse your skin, but it also works as a gentle chemical exfoliator—bringing you a double whammy of purifying and refining power. It contains anti-inflammatory white willow bark, a plant that has natural derivatives of salicylic acid. Fu describes her favorite cleansing oil as “basic but effective,” which is exactly how we like to keep our skincare regimen. It contains hydrating essentials like jojoba oil and olive oil to give your pores a major hydration boost while removing all of the dirt and makeup lingering within them. Another cult-favorite, this pick contains a fusion of naturally nurturing ingredients like moisturizing jojoba and antioxidant-rich calendula and elderberry oils to replenish your skin as you wash away impurities. 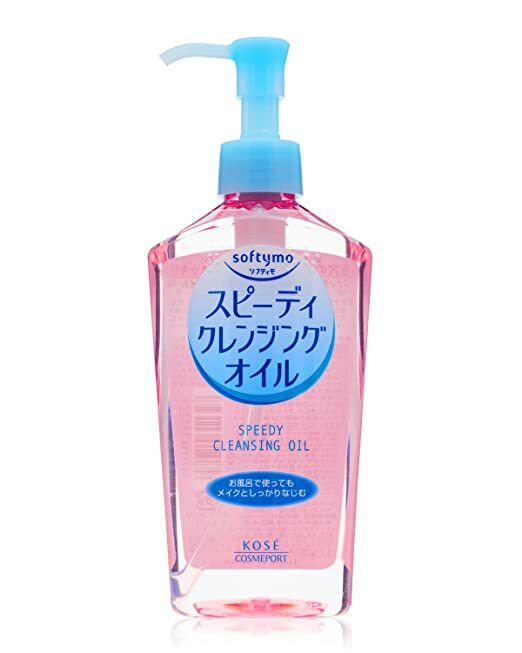 If you’re into K-Beauty, then introduce yourself to Japanese beauty — otherwise known as J-Beauty — with this cleansing oil. It’s one of Wu’s favorite cleansers for its swift ability to remove even the most stubborn of waterproof mascaras, thanks to the power of jojoba oil.